My friend Stephen Murphy worked on the makeup for the aged Tilda! To the 100-year-old Cameo Cinema to see THE GRAND BUDAPEST HOTEL. They were also showing INSIDE LLEWYN DAVIS. 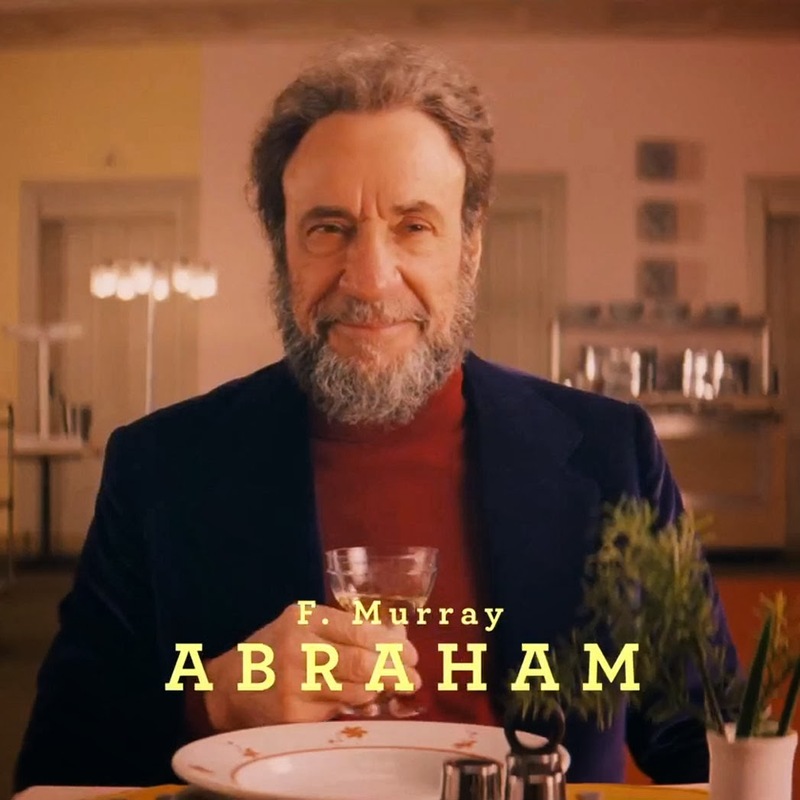 You wait ages for a movie with F. Murray Abraham in a roll-neck sweater and then two come along at once. I liked MOONRISE KINGDOM more than any other Wes Anderson film (though I still haven’t caught up with BOTTLE ROCKET which some people like best of all, considering everything subsequent to be an ever-downward spiralling into bloodless mannerism, which is a point of view) and I liked FANTASTIC MR FOX before that more than everything before that, so there was evidence that he was on a roll. I didn’t like this one as much as those but I enjoyed it. There was a slightly uncomfortable quality though. The art direction and look are as finicky and perfectionist as ever — I don’t dislike that so that’s fine. And he does vary the screen ratio, the font and even the lens I think on this one (unless all those zooms are all CG fake, which is possible), so in a superficial way we have to say he’s progressing artistically. I’ll come to the more thematic progress in a moment. More good stuff: Ralph (it’s pronounced “Ralph,” by the way) Fiennes is extremely funny and a little bit endearing, doing his Leonard Rossiter impersonation which he always does when asked to be light. No bad thing. I can’t decide if it IS an impression or if it’s just his natural comic mode. Weirdly, Peter Serafinowicz’s impersonation of Ralph Fiennes as Leonard Rossiter seems to predate IN BRUGES, the first film I saw in which he got his Rossiter on properly. Maybe he was inspired by it. The whole rest of the cast is very fine. It’s deliriously overdone, like everything with Anderson. Is this role a good use of, say, Harvey Keitel’s remaining time on earth? He mainly seems to have been employed to jiggle his pectorals. Couldn’t somebody who needs the money and exposure more be given a chance at that? But it was nice to see Jeff Goldblum, who doesn’t seem to do enough movies, and who should still be a top leading man, not some kind of guest star. Nobody else can do what he does. 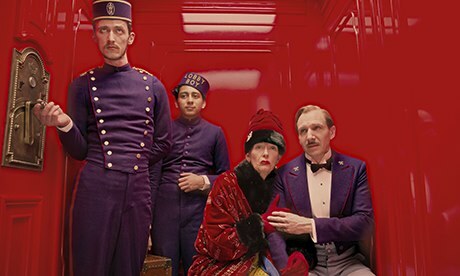 This is really the first Wes Anderson film with proper villains, it seems to me. 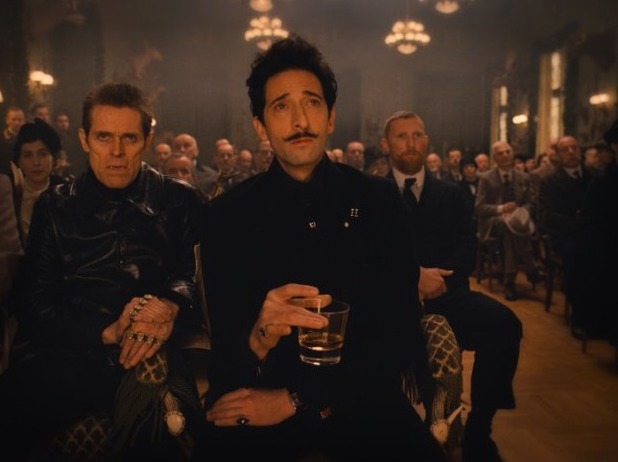 Adrien Brody is not really heavyweight enough compared to Willem Dafoe, who does all the nasty stuff anyway, so there’s a slight problem of dramatic priorities in terms of dealing with those characters and their evil schemes. The violence was startling for an Anderson film. 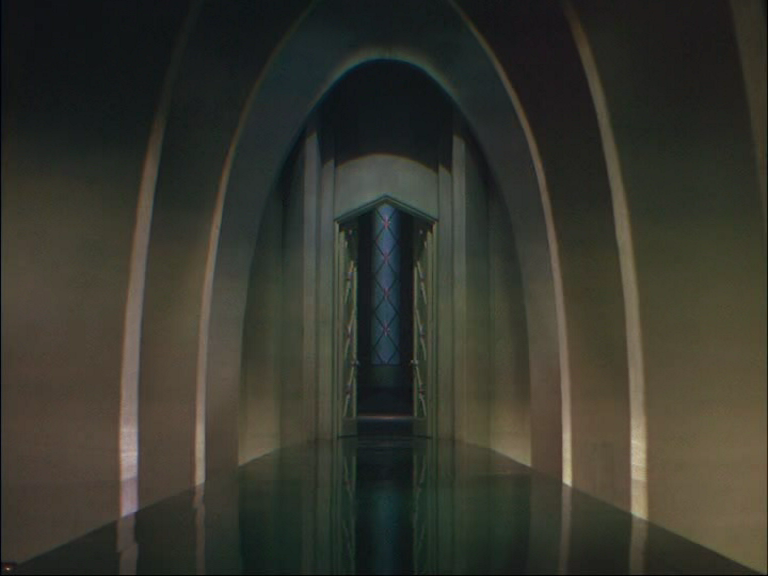 Sure it’s cartoony but it leaps out at you in this flat, pastel, artificial world. I felt it was a problem that (a) Anderson concocts his own version of European history, with a Ruritanian central setting (which is fine in itself) menaced by a fictional version of Nazi Germany (which was fine for Chaplin in THE GREAT DICTATOR but doesn’t make such clear sense here) and (b) gives almost all the violence to some scheming aristocrats — in other words, Nazi Germany, present by proxy, has almost no role in the story. I didn’t get the sense that the personal perfidies of Brody and Dafoe were there to be compared to the encroaching political darkness, either in terms of “These minor villainies are insignificant compared to what’s coming” or “These minor villainies are a microcosm of what’s coming.” I felt Anderson was actually uncomfortable dealing with the politics at all. He’s said that the kind of politics he likes in films is the kind you get in DUNE — fictional factions whose movements add to the reality of the created world, rather than saying anything about this world or making any kind of point. I mean, there are NO politics in DUNE — there are good guys, bad guys, and different factions, but there is no sense that the Atreides clan, the Harkonnens or the Emperor desire any different kind of constitutional set-up. It’s similar in GBH. The natural comparison would be with Lubitsch and TO BE OR NOT TO BE. How do you stage a comic operetta narrative against a backdrop of fascism? The difference is, Lubitsch had a compelling reason to do it and he knew what the reason was, and he clearly thought deeply about all his choices. I mean, for all I know Anderson had reasons and thought deeply too, I just don’t see the evidence onscreen. I think the film falls short of that part of its ambition which is serious, which is why I don’t feel reminded of the work of Stefan Zweig. One thing that was fun about MOONRISE KINGDOM was that it didn’t have any bad guys but still managed to function as a peculiar kind of action movie, making quite enthusiastic use of Bruce Willis as an icon of that genre. GBH has a chase through a museum seemingly inspired by the one in Hitchcock’s TORN CURTAIN (a lovely scene in a darkened hall full of suits of armour, each picked out of the enveloping blackness by its own personal spotlight, is the film’s most striking visual development — it doesn’t violate Anderson’s ironclad aesthetic, but it doesn’t look like anything else he’s done either) and a toboggan chase that comes either from ON HER MAJESTY’S SECRET SERVICE (an influential film, these days) or THE FEARLESS VAMPIRE KILLERS, though the figures’ movements in longshot have the speeded-up zaniness of FANTASTIC MR FOX. 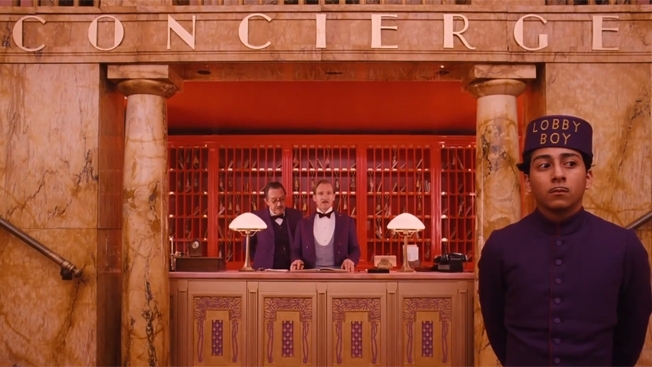 I would like another animated Wes Anderson film, please. 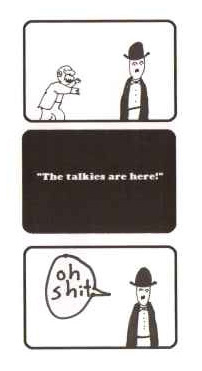 Of course, what’s worth remembering is that Chaplin embraced sound quite willingly — it was dialogue he resented. Having demonstrated that movies could quite happily combine expressive sound effects and music with pantomime, he finally bit the bullet and produced talkies with visual “islands”. Billy Wilder’s melancholy pronouncement “When he learned to talk, he was like a child of five composing lyrics to Beethoven’s Ninth” strikes me as unfair — THE GREAT DICTATOR, MONSIEUR VERDOUX and LIMELIGHT strike me as great films, and if they’re uneven, that unevenness isn’t necessarily the fault of the dialogue — the Adenoid Hynkel scenes in TGD are the comic highlights, and many of them intersperse crisp one-liners amid the slapstick.